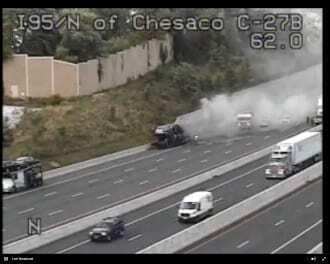 Crews were busy working to extinguish a vehicle fire along Interstate 95 on Wednesday afternoon. At about 3:30 p.m., fire crews responded to southbound I-95 just past the I-695 interchange, where a vehicle was fully engulfed in flames. All southbound lanes of I-95 were briefly shut down, but the left lane has since been reopened. The three right lanes just past exit 64 remain blocked at this hour.